If you are looking for a steadfast window design, then the double slider window is the right choice for you! Double slider windows feature two sashes that slide from side to side, allowing more light and air to enter your space. A high number of internal air chambers in the frame provides excellent insulation and energy efficiency. This window style is great for spaces that need proper air flow like bathrooms and kitchens, as well as for rooms where only one window can be installed. In other words, it is a perfect combination of security, style, brightness, and ventilation. Why Should I Install Double Slider Windows? They are easy to operate and provide excellent insulation, high energy efficiency, and outstanding sound-absorption. Innovative Insta-Lok technology allows the sashes to glide smoothly across the frame. Allows air circulation from both sides of the window. Perfect option for rooms with limited vertical space. They are easy to clean. Tilt the double slider to get access to the interior and exterior of the glass, then spray with a cleaner and wipe with a dry sheet. Equipped with weatherstripping to ensure no air escapes your home, therefore lowering your heating and cooling bills. A wide range of frame colours, hardware, and grilles to choose from. 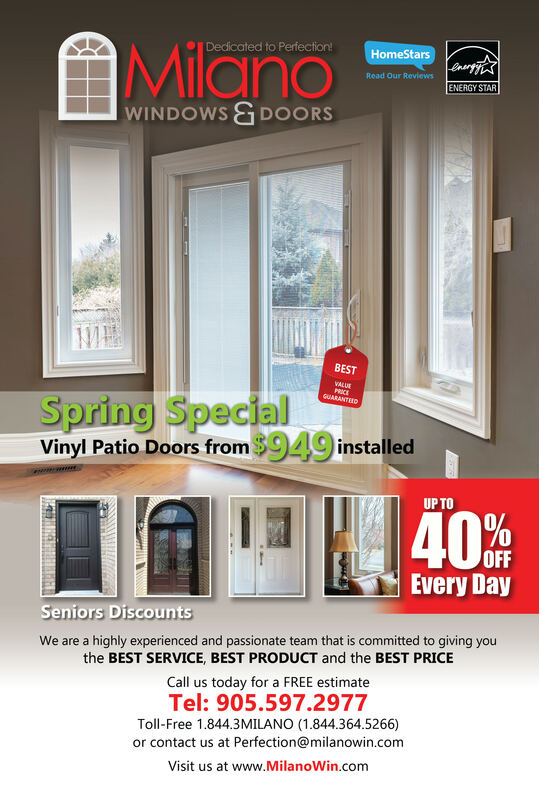 Milano Windows and Doors Inc. is your reliable source for top-quality windows and doors for a competitive price. We have proudly served hundreds of satisfied customers from all across Ontario – Toronto, Vaughan, Richmond Hill, Maple, Newmarket, Mississauga, Brampton and beyond. All of our products are sold under a transferable lifetime warranty. Contact our professional team today to learn more about our products and services.